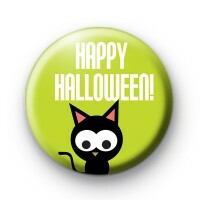 This is a cute Black Kitty On a bright bold green background with the wording Happy Halloween. Not too frightening or spooky this black cat is more cute than evil and would be fab in kids halloween party bags. Or to wear trick or treating.